Great Review from Allentown Show! What’s not to like about “American Idol” runner-up David Archuleta? Absolutely nothing, if you were at Allentown’s Crocodile Rock on Sunday. In a concert that spanned 70 minutes and 14 full songs plus a medley of four others, Archuleta sang with passion, exuded an engaging boyish stage presence and didn’t hit a single bad note with his rich tenor voice — and, in fact, hit many very good ones. He nailed the signature notes from the opening “Touch My Hand” (the title of which he took literally — handshaking the front row) to the killer closing of Robbie Williams’ “Angels,” and even outdid the big note on the recorded version of his hit “Crush.” He emoted often, but never in a cheesy way, and worked so hard that four songs into the show he was wiping sweat and by the end was breathing hard. 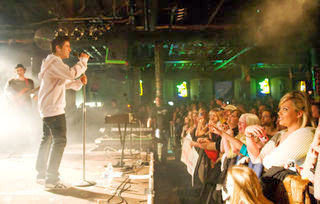 In a white hoodie, jeans and sneakers, Archuleta was delightfully disarming, dancing around the stage as you expect an 18-year-old would, constantly talking to the packed crowd (he even took a picture of them, explaining he wants to document his first solo tour), and frequently smiling and waving — which, of course, brought shrieks from the mostly teen-girl crowd every time. 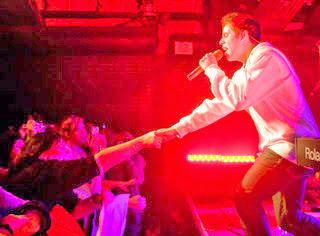 The show made the inherent weakness of “Idol” for Archuleta obvious: While great on other people’s material — during the medley he did Jason Mraz’s “I’m Yours” better than Mraz and, alone at the piano during the encore, made Pike County native Vanessa Carlton’s “A Thousand Miles” believable for a vulnerable male voice — he was even better on his own material. But the highlight was the slower songs: “To Be With You,” with him on piano backed by violin, was heartbreaking, and as good as any torch singer. “Somebody Out There,” which he sang like a siren while sitting on a stool, would be a great wedding song. “My Hands” had a sweet a cappella coda. As talented a pop singer as Archuleta is, his wonderful voice just seems suited to songs that center on it, which may show where his future lies. And what’s not to like about that. OMG! I can’t read this review enough. It thrills me with each reading. I agree with Mr. Moser about the weakness of American Idol being that it fails to allow singers to perform their own material. While David was great singing such songs as “Think of Me,” “Smokey Mountain Memories,” and “Love Me Tender”, we have seen what he can do with original material. Just think if he had performed a song like “Crush” on AI!!! I can hardly wait till I get to see David in his first solo concert. I love this review. Thanks for sharing. Every time I feel dispirited about the progression or lack thereof in David’s music career, something comes along to snap me out of my feelings of dejection. This review is stellar, and it’s a great reminder I shouldn’t let the mediocrity of those who sometimes seem to block the path of the trajectory that is David’s career affect me. I know good and noble causes have to work harder in order to achieve their goals. In the long run, this gradual ascent is probably best suited to David’s personality and musical progression. Realizing this, I struggle to reign in my desire for the world to recognize right here and right now what we as true fans already know, which is that David will become the most beloved recording artist of his time. David expresses emotion vocally like no other contemporary artist can. His sincerity shines through, and I’m glad you saw and felt what so many of his fans have since day one. This young man is the real deal, and his star is burning very brightly indeed. Thanks for your comments Katheryn, many a times I have been saddened by what I perceive as biased actions by certain people and organizations. Then I’m gladdened by reading comments by my fellow fans of David and when someone in the media “gets it” my heart just soars. I don’t spend a lot of time worrying about David’s career. Katheryn makes a good point that David will benefit from a slower rise to full-blown stardom. Just think how much he has learned as a performer since last summer’s AI tour! Now during his solo tour, he is singing many more songs and adapting to the rigors of being the headliner. And soon he and the band will travel across the seas in two directions — to the U.K. and the Far East. And let’s not forget that David has not even finished high school yet! Yeah, I think the pace is about right. We wouldn’t want to burn him out. I hope he will have quality time for songwriting and piano-playing. His future CDs will be worth the wait.